Acting from Shakespeare's First Folio examines a series of techniques for reading and performing Shakespeare's plays that are based on the texts of the first ‘complete’ volume of Shakespeare's works: the First Folio of 1623. Do extra syllables in a line suggest how it might be played? Can Folio commas reveal character? 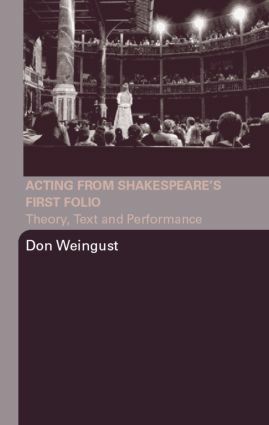 Don Weingust places this work on Folio performance possibility within current understandings about Shakespearean text, describing ways in which these challenging theories about acting often align quite nicely with the work of the theories' critics. As part of this study, Weingust looks at the work of Patrick Tucker and his London-based Original Shakespeare Company, who have sought to discover the opportunities in using First Folio texts, acting techniques, and what they consider to be original Shakespearean performance methodologies. Weingust argues that their experimental performances at the Globe on Bankside have revealed enhanced possibilities not only for performing Shakespeare, but for theatrical practice in general.